Home / Oriana Lamarca Designs / An unexpected pop of color! An unexpected pop of color! 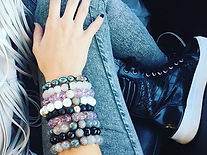 Whether you love to dress in bold colors or just accessorize with them, creating the perfect armparty is simple and an easy way to be chic and trendy. Being trendy and staying current with trending colors, patterns and styles doesn't mean you have to dress like you're walking the runway of NYFW. The best part about accessorizing with armcandy is that you stay ahead with current color trends, introducing color in small doses while making a big impact. This months featured armcandy is Lavender Jade, which, like its pantone counterpart, eminates great joy, love and health when worn! Jade, in all forms, is valued most for its metaphysical properties. It is considered a powerful healing stone and an amulet of good luck and friendship, Jade signifies wisdom gathered in tranquility, dispelling the negative and encouraging one to see oneself as they really are. It’s time to think Spring, think warmer weather and brighter colors! Colors are one of life’s magical things. Playing with color is fun but for some it can also be challenging. Especially with so many arm candy options, how do you chose?When planning the perfect armparty, start with the desired color of choice and a source of inspiration. You can draw inspiration from your patterns in your surroundings, in this case I chose the floral print from one of my favorite dresses this season! (check out The Fashionista Frugalista for details). 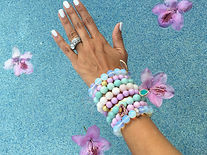 Floral prints are a huge trend this spring and usually consist of 3-4 colors that you can pull from to plan your armparty. So I started with the lavender jade, naturally, and then highlighted the darker tones within the flower with amethyst and magenta jade, some white howlite to pick up the white trim along the sleeves, adding some peacock pearls to pull in some of the grey/blue tones and the all hammered gold to add some shine! - pair with a neutral black onyx, white howlite or beige riverstone to add an unexpedcted pop of color to an otherwise neutral armparty! And hurry hurry because they are on sale all month long! !